Is Windows 7 for Netbooks a Non-Starter? Improving performance is one of Microsoft's design goals with Windows 7, and many early reviewers (including ours) have said that the new OS seems peppier than Vista. 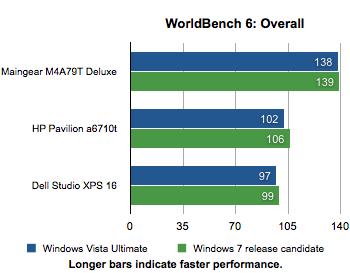 But tests of the Windows 7 Release Candidate in our PC World Test Center found that while Windows 7 was slightly faster on our WorldBench 6 suite, the differences may be barely noticeable to users. We loaded the Windows 7 Release Candidate on three systems (two desktops and a laptop) and then ran our WorldBench 6 suite. 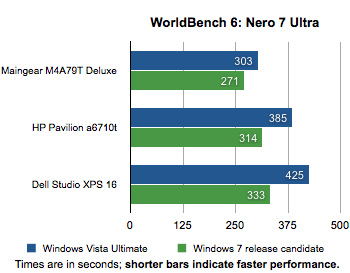 Afterward we compared the results with the WorldBench 6 numbers from the same three systems running Windows Vista. Each PC was slightly faster when running Windows 7, but in no case was the overall improvement greater than 5 percent, our threshold for when a performance change is noticeable to the average user. The largest difference was 4 points--102 for Vista versus 106 for Windows 7 on an HP Pavillion a6710t desktop. Our other two test machines showed similarly minor performance improvements: A Maingear M4A79T Deluxe desktop improved by 1 point (from 138 on Vista to 139 on Windows 7), and a Dell Studio XPS 16 laptop improved by 2 points, from 97 on Vista to 99 on Windows 7. WorldBench 6 consists of a number of tests involving ten common applications, including Microsoft Office, Firefox, and Photoshop. On the individual tests, the benchmark results were generally within a few percentage points of each other. One notable exception, however, was Nero 7 Ultra Edition, where Windows 7 made significant improvements, ranging from a 12 percent speedup to a 26 percent speedup, depending on the PC we used in our tests. Although we have yet to confirm it, PC World Test Center Director Jeff Kuta notes that this difference may be due to updated hard-disk drivers in Windows 7. Any improvements to Windows 7's disk support will be more noticeable in an application like Nero, which uses the hard drive heavily. The test involving WinZip, another hard-drive-dependent task, also showed marked improvement under Windows 7. In contrast, however, each of the systems took slightly longer to perform the tests in Microsoft Office and Firefox when they were running the new operating system than when they were running Vista. Of course, it's important to remember that we performed these tests with the release candidate of Windows 7. Though the operating system's features likely won't change in the final version, Microsoft’s engineers may still find ways to tweak the code to improve performance. If these test results remain consistent with those for the final version of Windows 7, the news will likely be disappointing to many Windows users. One of the major complaints about Windows Vista was the fact that it was consistently slower than Windows XP. If Windows 7 doesn’t significantly improve that situation, it may fail to convince people to move away from Windows XP. That said, there may be other areas we didn't cover in our testing--such as startup times--where Windows 7 may outperform Windows Vista by a wider margin. The best way for you to get a feel for Windows 7's performance is to download the release candidate and take it for a test drive on your system. We used three PCs in our testing: a Maingear M4A79T Deluxe desktop, an HP Pavillion a6710t desktop, and a Dell Studio XPS 16 laptop. The powerful Maingear comes equipped with a 3.2GHz AMD Phenom II X4 955 Black Edition CPU overclocked to 3.71GHz, 4GB of memory, and dual ATI Radeon HD 4890 graphics processors. The Pavilion, a mainstream desktop, features a 2.6GHz dual-core Pentium E5300 with 3GB of memory and an nVidia GeForce 930GE graphics chip. Lastly, the Dell Studio XPS 16 laptop packs a 2.4GHz Intel Core 2 Duo processor, 4GB of memory, and an ATI Mobility Radeon HD 3670 graphics card. On all three systems, we ran our WorldBench 6 benchmark suite on a clean installation of the 32-bit edition of Windows Vista Ultimate with SP1 and repeated the process with the Windows 7 Ultimate release candidate (again, the 32-bit version). We made both operating systems current with Windows Update, and we installed the most current hardware drivers available. Though Windows 7 edged out Vista in our lab tests, you may not notice much of a difference. Microsoft endorses running Windows 7 on PCs equipped with solid-state disks for better performance. Analysis: Four things that Mac OS X can learn from Windows 7.